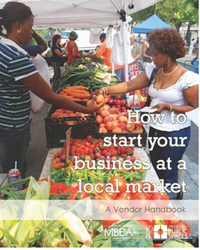 Historically, public markets have provided an entry point for small business to thrive. They are vital places for entrepreneurs, especially minorities, immigrants and women, to test their ideas with modest risk and investment. Today, the market tradition is alive and well, and with it the start-up spirit that makes our markets unique. Farmers, crafters, artists and even re-sellers want to tap into the opportunity a market can bring, but many don’t know where to begin. However, being a successful market vendor requires a particular set of skills and a love of competition! You can download the free PDF on our website here. You can also download the Spanish version here.